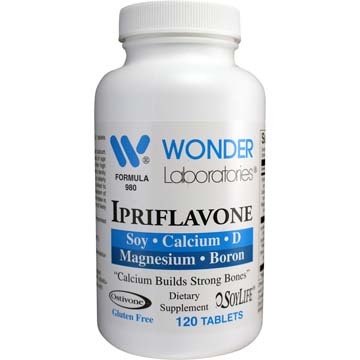 Ipriflavone is a product derived from soy plants that's used to build and support healthy bones in aging women and due to certain medications. Get as much calcium as possible from food. 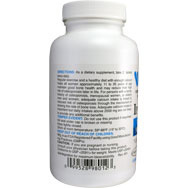 Make up any shortfall with supplements. Buy supplements by price. Calcium carbonate is cheapest. If it gives you gas, take smaller doses or switch to another form. Get enough vitamin D, which is essential for bone health, especially if you're over 50. Normally your body makes enough D when it's exposed to a little sunlight, but after age 50 your body produces less. Get at least 400 IU a day (that's the amount in a quart of fortified milk or most multivitamin/mineral pills), 800 IU if you're over 65. Some calcium pills also contain D.
If you are taking thyroid hormones, the antibiotic tetracycline, corticosteroids, or iron pills, talk with your doctor or pharmacist. Calcium can interfere with these and some other drugs or minerals. 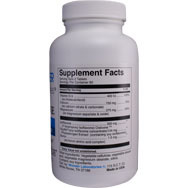 Directions: As a dietary supplement, take 2 tablets twice daily.